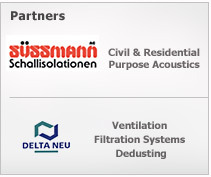 Established in 1984, today Sira is a leading Company in both civil and industrial noise control fields. More than 25 business years. during such a long period our knowledge ranged over all industry fields experience, designing and carrying out noise control interventions over countless plants and machineries. We can provide solutions to any noise related problem. Every Sira project is like noone else before, referred to exclusive customer’s needs and designed not to alterate destination system’s functionality. A true passion for sound. Our mission is to remove all kinds of noise pollution related problems. We pursue this goal with the know-how and knowledge of our specialized, sound science expert staff, as well as 25 years of field experience. Acoustic science mastering and deep knowledge of applicative techniques into mechanical and industrial system areas: these are our know-how milestones. Sira performs phonometrical and vibrational analysis, noise-impact evaluations and studies, either previsional or aimed to noise removal interventions. Our technical staff will perfom wide-ranged acoustic surveys and expert reports. Mastering crafted quality with industrial technologies. From theory to application: design, engineering and industrialization are linked when early projects become Sira products. Our handcrafted products are methodically controlled to achieve unsurpassed quality excellence in both mechanical features and noise damping performances. Noise removing systems and high complex soundproofing structures: Sira ensures total reliability when hi-tech and safety standards are needed for equipments and processes. We supply world leading Companies for critical projects and advanced technologies. Sira wins for liability and outstanding durability of every product. Among with guaranteed noise pollution solutions we can provide WPS and WPA certified welding processes performed by our PQR certified welders. Our operators are able to exectute a complete range of materials and thickness weldings. Sira painting processes take into use water-based materials, environmental safe compliant; they are guaranteed for both internal and external application purposes. We can provide NACE certifications for painting cycle and coating warranties. When noise removal interventions require to carry out complementary or integrative systems, Sira will provide the best available solutions for air conditioning, electrical, lighting, ventilating needs. Sira operates with highest quality standards, certifying silencers and vessels in compliance to PED - Pressure Equipment Directive; producing dangerous or explosive areas systems in compliance to ATEX - ATmosphères EXplosibles directive; joining automation and control systems with PLC - Programmable Logic Controller sytems and machine cycle interface.